Nick Dean is perhaps best known as a friend-of-the-blog and a participant in the Camp Twee Legonomic Summit at Brickworld 2011, but he has had many other exploits, including building some neat planes and tanks and Bioshocks. He also has a storied past with attempting to enforce design guidelines on to others. His latest foray into a likely future of Planning Boards and Historic District variance applications is a collaborative display for Brickworld 2012. Perhaps it is the rarified Cincinnati air, or a shared reaction to the EIFS and pastel deconstructionism at the College of Design Architecture Arts & Planning, but his vision bears a striking, and welcome, similarity to our own aspirations of a closely planned collaborative display. 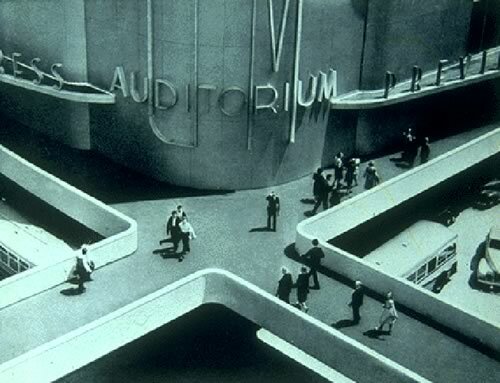 In our case, it was a moonbase revitalization, the 2193 Lunar Columbian Exposition, in his, a City of the Future likely drawing inspiration from the 1939 NY World's Fair's Futurama exhibit. Indeed we find images of Futurama within his growing pinspiration board. Will his endeavor succeed without RAMMing rules down peoples throats? Will the layout be overrun by brickarms and bullet holes? We are eager to find out! Thanks for the plug, Kevoh!